You get 2 USB crank radios with this order. This compact 4in1 emergency crank radio is a must have tool in every emergency and disaster survival kit. 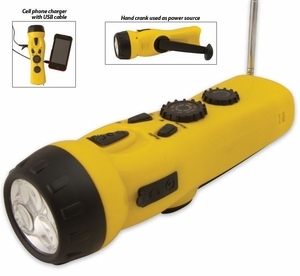 This high quality radio flashlight comes with emergency siren and USB charger for cell phones built in. The hand crank design means that it never needs batteries. How do I charge my phone with this unit? This radio/charger unit comes with a special adapter cable that connects to the charger unit and to the USB charging cable that came with your phone. Step 1) Connect the round plug of the included adapter cable to the radio/charger unit. Make sure you plug the adapter cable into the charging outlet and not the earphone outlet! Check the symbols on the rubber cover. Step 2) Connect the USB cable that came with your phone to the adapter cable. Step 3) Connect your charging cable to your phone as you usually do. Step 4) Turn the hand crank on the radio/charger in a consistent and steady motion to generate electricity to charge your phone. Observe the charge indicator on your phone to check if your battery is being charged while you crank. The time it takes to charge your phone varies by phone and battery condition.